The Disney films of my childhood were those of the Disney Renaissance, Beauty and the Beast, Aladdin and of course the Lion King. One of the most vivid memories from my child hood is my first cinema experience, it was a Sunday in 1994 me, my uncle and three cousins went to see the Lion King we sat on the front row and I remember being amazed by the giant screen that was in front of me. Its strange how many of my memories have the Lion King in, My dad once won some money playing Bingo, he bought me a Lion King bag for school, I was around 4 or 5 at this point, I loved that bag. I remember the day we got the VHS which was also a Sunday and finally I remember my stuffed toy of Simba that I took everywhere. It's safe to say that the Lion King is my all time favourite Disney movie. The Lion King tells story of Simba and his journey from a cub to reclaiming his place in the ‘circle of life.’ The story starts as Simba is born and presented to a gathering of animals beneath Pride Rock, as the new born prince Simba is next in line to the throne much to the dismay of his uncle Scar. 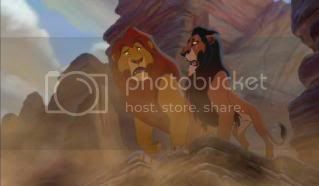 As Simba is shown around the Pride Lands his father Mufasa, who is the current king warns him never to go to the Elephant Graveyard which lies behind the pride lands. Of course as any child would a curious Simba takes his friend Nala to the Elephant Graveyard where we meet the Hyenas for the first time. Rescued by Mufasa Simba and Nala realise they should not go looking for trouble. But an angry Scar who had deliberately told Simba of the Elephant Graveyard to trick him in to being killed by the Hyenas formulates another plan this time to kill both Simba and Mufasa. What follows is one of the saddest scenes in any film I have ever seen let alone a Disney movie. Scar tells Simba to wait in the gorge as “His father (Mufasa) has a present for him” Scar mocks Simba telling him to “work on his roar” as he leaves Simba begins to practice his roar. We then see the Hyenas who have been told to scare the wilder beast into stampeding down the gorge straight to where Simba is. Of course as Simba manages to squeeze out the tiniest roar the Hyenas trigger the stampede. 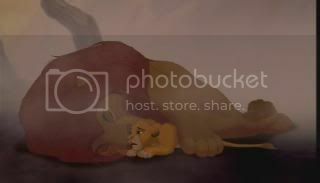 The score used over this scene is dramatic and saddening, the start of the music sounds like someone is gasping in shock, an emotion I'm sure most viewers felt at watching this scene, not only was this dramatic and unsettling but Mufasa was the first Disney character to die on screen. So back to the scene, picture a small lion cub caught in the middle of a stampede of wilder beast, almost like a child drowning in an ocean. We see Simba desperately try to stay on a broken tree branch, but as Mufasa arrives its clear that he will not be able to hang on long. 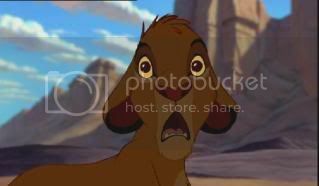 Mufasa charges at the stampede, the reaction any parent would have in seeing there child in such danger. He rescues Simba but falls back to the ground, with one last effort he leaps at the rock. He desperately asks Scar to save him, Scar grabs his paws looks him in the eye and says “long live the king” Scar then throws Mufasa to his death, we see Mufasa fall as we hear Simbas heart breaking cry. As the smoke clears we Simba calling for his dad, we see the lifeless body of Mufasa against the same tree Simba was hanging on to earlier, it's clear to the audience Mufasa is dead. Simba runs over to him and does not believe what has happened a reaction I myself had the first time I saw this film. Through his tears Simba tells his father they must go home, he tries to wake him but no avail, eventually admitting defeat and curling up beside his paws. We now see how young and vulnerable Simba really is, compared to is father he is so small. Scar appears discovering Simba is not dead, he plays the guilt card. Pushing samba from the denial part of the five stages of death to the guilt stage. Simba blames himself; he obeys Scar and runs away where he is chased by the Hyenas. Scar thinking both Mufasa and Simba dead returns to Pride Rock to become the new king. So why is this scene in my Top 10? I re-watched Lion King today with the intention of really analysing that scene. I could not take my eyes of Simba his reaction seemed so real. I will break this down in to what I feel are the most heart string tugging shots. Mufasa look of realisation as he realises his son is in trouble, he freezes, tells Simba to hold on but eventually rushes to his rescue. 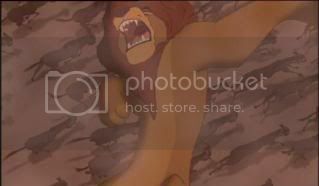 We see Mufasa rush into the stampede to rescue Simba, first we see Simba ly through the air caught by Mufasa who is hit by a Wilderbeast, knocking Simba flying from his mouth. to reinforce the strength of the wilderbeast as Mufasa catches back up to Simba and jumps, a wilder beast is hit by another and flys forward towards the camera. Simba anxiously looks on as his dad i knowhere to be seen, finally Mufasa starts to climb the rock and Simba runs to the top to great him. As Mufasa gets to the top he begs Scar to help him. 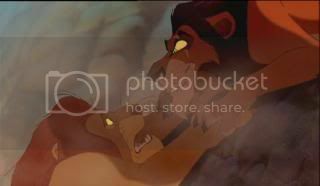 Scar grabs his paws looks him fiercely in the eyes and says "Long live the King" and throws Mufasa from the rock face. As Mufasa falls, we hear Simbas blood shattering cry, and its then that audience realises Mufasa will not survive this scene. As the dust settles, Simba finds his dad, intially trying to wake him telling him they need to go home Simba eventually realises his dad is not going to wake up and screams for help. Simba crawls under his fathers paw, we now see how small and vulnerable Simba really is. Of course its at this point Scar comes over to tell Simba his side of the story. 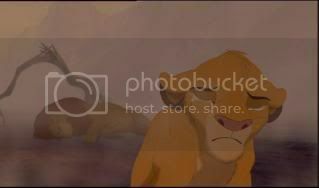 Scar's confirmation of Mufasa's death shocks Simba as he looks up to Scar who blames him “If it wern’t for you he would still be alive” Scar then asks “what would your mother think?” scaring Simba into not going home, reinforcing Simba's age and size is Scars condescending tone towards him. When Simba asks what he should do Scar's answer is to run away and never come back. Watching Simba see his father fall to his death is sad, his reaction is of shock and confusion, the same reaction a person would get upon watching someone die. Simba is a lion, but the anthropomorphic qualities of the character strengthen the emotions in the film. Sorry guys I didn't mean to upset you! I remember being a bit surprised by that sequence when I first saw The Lion King. And it is my least favorite part of the movie. I loved the Disney movies when I was little. But, I never remembered that they were so sad until I re-watched them as an adult with my niece and nephews. I wonder whether the innocence of youth softens the tragic elements. Or, the experiences of aging makes them more poignant. If a hero dies there death is mourned where as if a villain is killed the death is not mourned.. its like they deserved it. You know other films where that is different? True, although often a villain will be mentioned... its more common practice for a villain to be apprehended and not murdered. I always thought it was quite sad, that often the villains were not mourned... Although this kind of changed in the Lion King 2... Zira spends the most of the movie mourning Scar and wanting revenge. she also mourns the death of her own son who is killed as a villain. Narrative has to have an emotional focus for the viewer, which is something that always interests me because shifting focus is incredibly hard and rare (Psycho, moments of Inglorious Basterds, etc). It would be very difficult to ask the audience to mourn the hero with whom they have connected, and then repeat for another character, villain or not. Even if it's only an aside. Toy Story like the Lion King is a film that played a huge part in my childhood. I got Toy Story on VHS on release, I had not seen it previously so it was a new experience to me. I loved it I watched it every day for weeks, I would get the toys I owned that most resembled each character in the film and played with them... But Buzz and Woody were missing, I had no toys that resembled those two. Christmas came and so did the mad rush for the year's top toy, sadly that year was Buzz Lightyear. I did not get Buzz for Christmas but I did get Woody. I loved my Woody doll, and as Andy did I wrote my name on his shoe. I took Woody on holiday with me, I took him everywhere. He ended up being filthy... Woody was a toy that could not go in the washing machine as he had a voice box and batteries... sadly, his voice box once broke and my dad had to do an “operation” to fix him... To this day I don't know how he did it. One day in Birmingham we came across Toys ‘r’ us inside there was new delivery of Buzz Lightyear... my parents bought one each for me and my brother instantly... the rest is history. Upon hearing there would be a sequel to Toy Story I was very excited, I went to see it at the cinema. I was amazed by it. Although I hated the character of Jessie, one part of the film stuck in my head, the same part that sticks now. A moment so sad and revealing that re-watching 10 years later has entirely changed my perception of the Toy Story franchise. 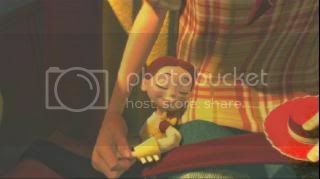 Toy Story 2 starts where the original leaves off, the toys are now settled in Andy's new room, they are discussing Andy's trip to Cowboy camp, sadly in between this talk and Andy leaving Woody's arm is ripped, Andy does not want to take him and he is put on a shelf. Andy's mum later comes back and throws some toys in a box to take to her garage sale. In this box she throws Wheezy penguin. Woody decides to save Wheezy and ends up being stolen by Al “the man in a chicken suit” upon arriving at Al's apartment its clear he is a huge fan of Woody's round up” the show which made Woody famous. At Al's house Woody is fixed by someone who looks remarkably like Jerry from a Pixar short entitled Jerry's Game” at the house Woody meets Bullseye, Woody's faithful companion on the Woody's round Up TV Show, he meets Jessie a cow girl and Stinky Pete (The Prospector) Of course, as Woody saved Buzz in the first movie, Buzz makes it his mission to save Woody. Although, it's at Al's house that the scene that changed my perception of the franchise happened. The song “When She Love Me” was written by Toy Story Soundtrack favourite Randy Newman, I have always felt the song enhanced the sadness of this part of the story. As I said, I did not like the character of Jessie after this scene I felt sorry for her situation was sad, but I never grew to like the character or any of the new characters in the film. I always wondered if this scene would be as poignant without the song... and so I watched it with no sound. The scene still brought tears to my eyes not as much as it did with the song. So I rewound, but the volume up and re-watched. The scene instantly got sadder. For me the saddest part of this scene is when Emily (the girl) finds Jessie under her bed, the idea that “things were going to be the same” only made it worse, when we find that Jessie had in fact been taken to a donation pickup area. 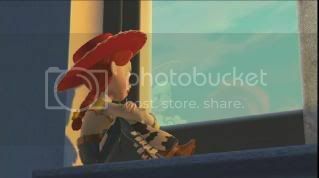 Here we see Jessie, at this point Woody has been talking about how he has to get back to Andy, because Andy loves him. 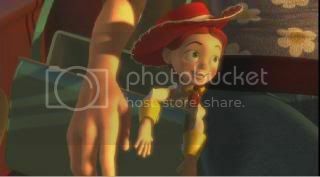 Upset by this Jessie walks away only to be followed by Woody who again, tells her how great Andy is. Jessie snaps back at him telling him she knows what its like but it will change. Here we see Emily playing with Jessie happily, after going to a small park the two return in the car. Jessie is safely tucked in Emily seatbelt, Emily strokes her hand in a comforting way (maybe the same way you would comfort a tired child?) Jessie seems to go to sleep. 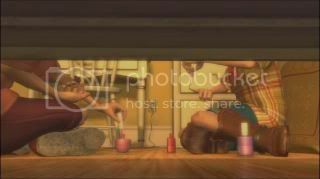 After Jessie falls under Emily's bed she looks out to see Emily is starting to grow up, she's into makeup and has her friend over. very different to the days she dressed as a cow girl. At this point we see that Jessie thinks every thing will return to the way it was. She sits in Emily's bag in the car as they return to the same park from earlier. We now see that Jessie has been put into a box in a area where a charity collection vehicle lies stationary. We can see that things have not returned to normal and that Emily truly has moved on. So why is this scene sad? I guess even as a child I really understood why this scene was sad, I just never really thought about it until I had to write about it. For me the idea that eventually my parents will leave is a horrible feeling, hearing them talk about “when they die” makes me feel terrible as I'm sure anyone else, the other side of this is as I said, I don't have my own children. But I'm sure to a parent the opposite is true, the realisation that one day there child will no longer leave them is a scary prospect. The idea of loosing anyone is sad, and in re valuating the Toy Story series I can now see a deeper meaning in it. Maybe I'm reading to deeply into this? But seeing this recurring film has only reinforced this scene making it all the sadder. Hmm, thats an interesting point, Id like to hear a parents take on that scene. what do the parents out there think of the relationship between Emily and Jessie?